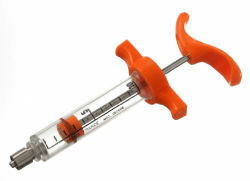 High quality, durable, long lasting nylon syringes at economical prices. All syringes come with spare o-ring. Have been field proven for over 30 years. Clear plastic barrel has bold, black-inscribed numbers and orange handles. These syringes have a luerlock/luerslip needle holder. Autoclavable up to 260 degrees Fahrenheit.